CAPE CANAVERAL, Florida - The launch of a re-used SpaceX Falcon 9 rocket carrying a BulgariaSat-1 satellite is scheduled to liftoff at 2:10 p.m. Eastern Daylight Time on Friday, June 23, 2017, from Launch Complex 39A at the Kennedy Space Center in Florida. The launch window is open for two hours. 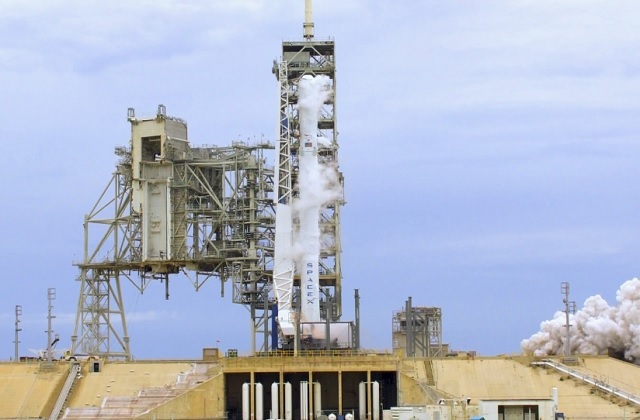 This will be SpaceX's second launch of a reused first stage rocket. This Falcon 9 rocket was previously launched with an Iridium NEXT Constellation satellite from Vandenberg Air Force Base in California in January 2017. The first stage was then shipped to MacGregor, Texas to undergo refurbishment and testing before being sent to Florida. Following stage separation, the first stage of the Falcon 9 will attempt an experimental landing on the “Of Course I Still Love You” droneship. But a successful landing after launch may be difficult because the Geo Stationary Transfer Orbit requires the first stage rocket to reach a significantly higher altitude than other recovered missions. This means that Falcon 9's first stage rocket will becoming down faster with less fuel to slow its descent than prior landing attempts. BulgariaSat-1 is a communications satellite that will be located over Bulgaria in a geostationary orbital position and will provide television and data communications services to homes in that region of eastern Europe. According to the latest forecast by the U.S. Air Force 45th Weather Squadron, there is a 90% chance of acceptable weather conditions for Friday's launch. The primary weather concerns are cumulus clouds.